As fans of BBC Landward we have long admired Nick Nairn for his down to earth cooking and love of Scottish food. So we leapt at the chance to dine at his Kailyard restaurant at the Dunblane Hydro Hotel and we were not disappointed. The journey through the long drive helps to bring calm to anyone who has journeyed far and turning the corner rewards you with magnificent views of this commanding sandstone building that towers over the estate. Beautifully back lit and so stunning. It was a rare treat for these two former army nurses to visit what was a former military hospital during the World War. But there was no hustle and bustle as we easily parked and checked into our room, just serene calmness which continued throughout our two day stay. Do book in advance for your meals at The Kailyard Restaurant because it does get understandably busy. It opens from 6pm until 10pm and the tables are well spaced out to afford diners with privacy. We found everything spotlessly clean and well presented, though the menus were well thumbed through, another sign of the popularity of this fine dining eating establishment. The menus change every day to ensure that guests at the Doubletree by Hilton (formerly called the Dunblane Hydro Hotel) get a chance to experience the best of Scottish food by Michelin star chef Nick Nairn. 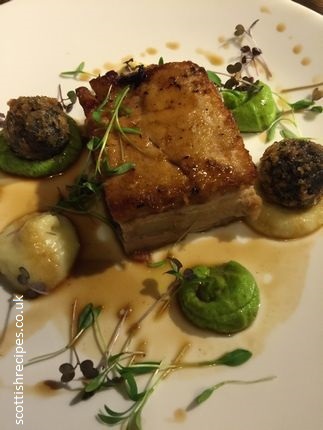 There is no pretension here: though the food equals some of the best places we at Scottish Recipes have eaten, there is no overly fussy presentation or silver service. So you can sit back and relax in the comfy seats and enjoy the company and grub. And what portions! You won't leave hungry if you take advantage of the three course meal for just under £30. Nick continues his love of Scottish food and sources ingredients throughout Scotland. So for example his halibut is from Scrabster whilst the haddock comes from Peterhead. Free range chicken is sourced from Aberdeenshire and the salmon from Loch Duart. Accompanying dishes are also sourced from our great country so you get lentils, kale and tatties with your dish. The knife smoothly sliced through the pork and there was a satisfying crunch from the crackling. The pea puree was cleverly presented and tasted so intense without being overpowering and the black pudding was the ideal choice companion to this wonderful starter. We've never added soy sauce to pork before, but what a fantastic idea! Our mains arrived comfortably soon after, despite the restaurant being so full, a sign of efficient chefs and waiter staff. 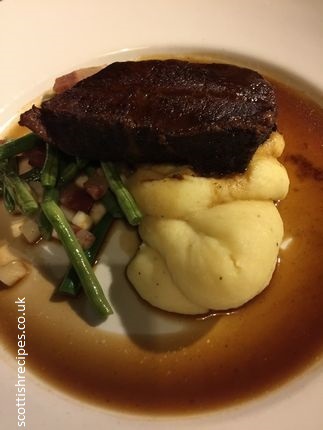 We enjoyed slow braised Daube of Scotch beef with champ, seasonal greens, pancetta and red wine gravy. And like the previous meat it was cooked to perfection. We never really know what to say in a review about the food, but it does say it all that we tucked merrily in and finished the meal with aplomb. Each ingredient complemented the other and you could tell that great thought had gone into the dish. Other dishes we could have enjoyed included haggis wontons with roast beetroot, trompette mushrooms and whisky gravy or char-grilled Mossie Farm pork chop with garlic and thyme fondant potato, Savoy cabbage and carrots, caramelised apples and cider gravy. We felt the mains would have satisfied the heartiest of appetites but diners can also add side orders for just £2-50 that includes creamy mash, hand-cut chips, dressed mixed salad, boiled new potatoes, buttered greens and rocket and parmesan salad. Do save room for the desserts which range from banoffee tart served with rum and raisin ice cream or the raspberry and white chocolate brulee with Gartmorn shortbread. We enjoyed both over a several nights stay and can well see why Nick Nairn became Scotland's youngest Michelin star winner. Special mention goes to his Executive Chef Colin Halliday who helped create such a thoughtful menu. At the time of writing this review one course costs £19.95, two courses £25.95 and three courses £29.95. Children are made welcome and have their own menus which includes breast of chicken served with mashed potatoes, fish & chips, cheese & tomato pizza or soft chocolate cake. More Best Restaurants in Scotland.